All summer I have watched as small piles of sawdust accumulated just beyond my back door. I didn’t know there were carpenter bumblebees until I got up close and personal with their handiwork: perfectly bored caverns in the wood railing outside my door, where future hordes of carpenter bees are bred. Not the greatest discovery for a housewife who has longed for a carpenter husband from time to time. Not that I’m complaining. But he has his hands full without having to patch up bee-sized holes in the woodwork. 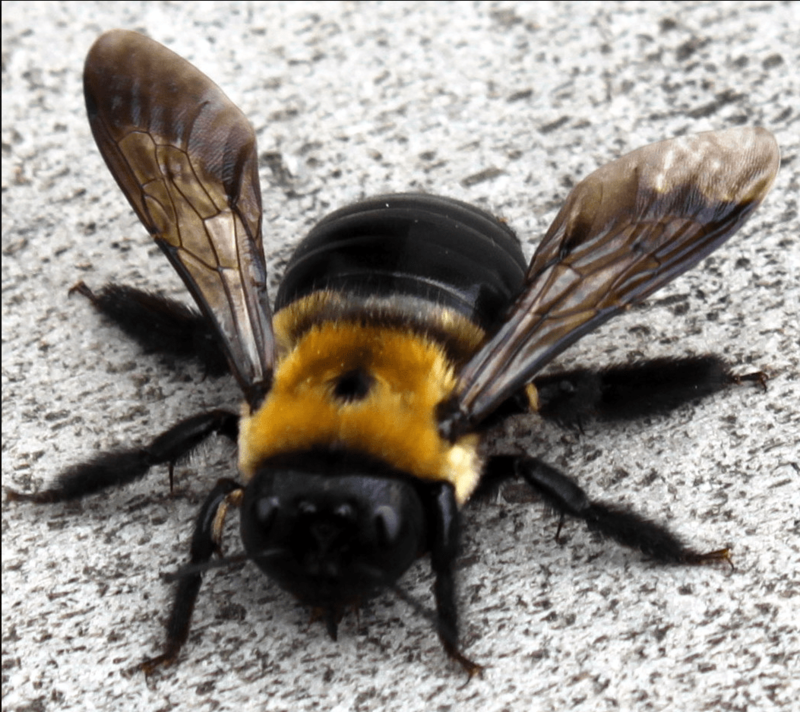 Which is why I was surprised at the compassion I felt for the disoriented carpenter bee when I almost stepped on him, his wings moving in a flightless frenzy as he slowly crawled across my back porch. I think he was trying to scare me, but it was futile. Oh dying carpenter bee, where is thy sting? Lucky for both of us, I learned the male carpenters don’t have stingers. I also learned they are generally solitary critters, worker bees without social habits. Knowing that, his dance of death made me feel all the more sad. What a lonely life – even though I realize it is what it is, by some design of nature. Not that I will miss the miniature dunes of dust and resulting holes that, no doubt, will remain as a monument long after he is gone. No, I think the sadness for me has something to do with the wonder of nature and the symbiotic pull of such a small critter. Without my wood porch, he would perish. Without his daily presence, I would have missed another one of those moments, in which the big world stops spinning long enough for me to get my bearings and actually see something otherwise indiscernible. Get close enough to a carpenter bee and you will fight the urge to pet him, once you are lost in the fine detail of his furry yellow thorax. Study his fat body and impossible filigree wings long enough, and you will wonder how this specimen gets off the ground. We have learned, with colony collapse in honey bees, that there are no small players in the food chain that binds our mutual existence. So it was, watching my carpenter bee in a death spiral outside my door, that I felt obliged to linger as he tumbled around, wings gasping for air, abdomen glistening in the autumn sun, his will to bore, to fly, to pollinate, to procreate – to live – exhausting all at once in a brilliant, valiant moment of truth for both of us.